The study of rocks under the microscope is called petrography. It is an essential tool in geology in its own right and as a precursor to more detailed studies. Much petrography is done examining thin sections of rocks where they have been mounted on a glass slide and ground to a thickness of 30 microns (0.03 mm) and then examined with polarised light. More specialised petrographic techniques include the study of polished sections with reflected light to study opaque minerals (minerography) and using transmission and scanning electron microscopy. We do not have the facilities to make thin sections at MDRS, nor do we have polarising or electron microscopes, although an actual Mars mission might well do so. 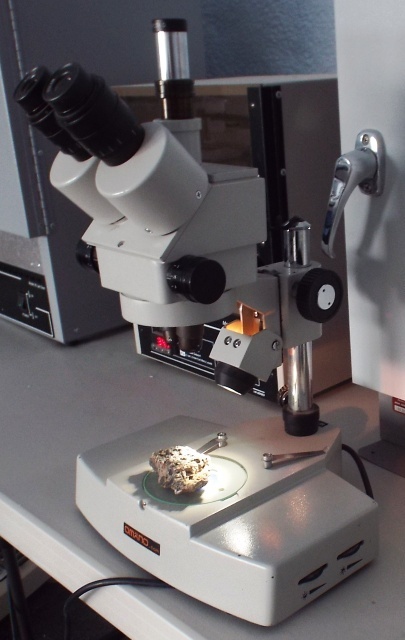 But examining and documenting rocks with high resolution digital photography and under relatively low magnifying power reflected light microscopy is still a very useful tool. Recent studies here at MDRS have shown this. Exotic clasts from the Fremont gravel terrace. Left: siliceous sponge from the Permian Kaibab Limestone. Fossil is 4.5 cm across. Right: oolitic clast from the Triassic Sinbad Limestone. Clast is 5 cm high. Several days ago Anushree and I picked up some interesting geological specimens in the course of an EVA to sample lichens and hypoliths from gravel terraces. 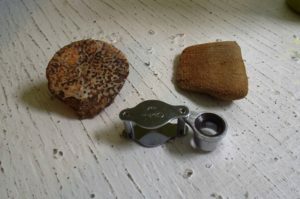 These are shown in Figure 1, and consist of a Permian siliceous sponge, probably from the Permian Kaibab Limestone and pebbles of oolitic limestone, probably from the Triassic Sinbad Limestone. The nearest outcrop upstream of these rock units are some 30-40 km away, in Capitol Reef National Park. Digital zoom of sponge fossil (left) and oolitic limestone (right). Light-coloured sponge skeleton contrasts with dark brown and yellow sediment fill of canals that are ~1mm across. The ooids are the small spherical grains~0.5 mm in size. These hand-held camera images have a resolution of ~20 microns per pixel, roughly equivalent to the MAHLI imager on the Curiosity rover on Mars. Zooming in on both rocks with a high resolution digital camera we can see some detail, roughly equivalent to that captured by the MAHLI camera on the Curiosity rover and about four times better than the Microscopic Imager on the Mars Exploration Rovers. The complex internal structure of the sponge is clearly visible. The white material is chert, formed by alteration of the opaline silica spicules that originally made up the sponge’s skeleton. The complex network of chambers through which the sponge pumped seawater and from which it filtered food particles, are visible by their dark brown or yellow sediment fills. 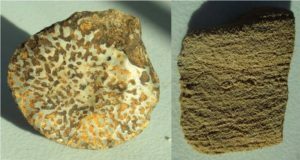 The close up of the oolitic limestone clearly shows the ooids, small round grains of calcium carbonate, that are diagnostic of warm, agitated clear-water conditions, super-saturated with calcium carbonate. They are found today as vast shoals at depths of between one and three metres deep in places like Great Salt Lake (Utah), the Bahamas, the Persian Gulf, and Shark Bay (Australia). Binocular microscope in the MDRS lab. Looking at the rocks with the binocular microscope (X7 to X45 magnification) in our lab reveals many more details, including the presence of rare fragmentary microfossils in the limestone and a concentric and radial structure to the ooids. The canal structure of the sponge is also revealed in more detail. Unfortunately our binocular microscope, though very useful, cannot be used for photography. The USB microscope. Left – the microscope mount showing LED light sources surrounding the optics. Centre – the USB microscope positioned again it’s subject (the fossil sponge). Right – the USB microscope and plugged in showing user interface on laptop. Fortunately Alex, our able commander, has brought on the expedition and extremely useful tool that allows us to examine rock surfaces at higher magnifications. This is the USB microscope, which comes with its own stand and LED light source and plugs into a laptop computer. A small piece of software provides the user interface which includes image capture at a range of resolutions. The USB microscope has a zoom lens from X10 to X200. 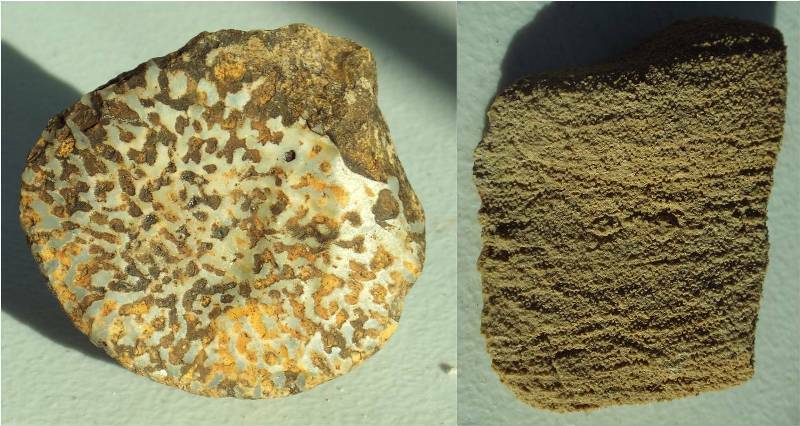 USB microscope image of Permian sponge (left) and Triassic oolitic limestone (right). Image taken at X60 magnification. Light-coloured cherty sponge skeleton contrasts with dark brown and yellow sediment fill of ~1 mm-sized canals. The concentric structure of the ~0.5 mm diameter ooids is visible in this image. The US microscope allows us to explore the rock surface in much greater detail, seeing details not visible in the digitally zoomed hand-held camera image. At X60 magnification, some further detail is visible along the margins of the canals in the sponge and the concentric structure of many of the ooids is evident. USB microscope images at X200 magnification. Left: complex spicule structure visible inside white cherty skeleton of Permian sponge, microfossils are present in the dark brown and yellow sediment fill of the canals. Right: Triassic oolitic limestone with both concentric and radial structure is visible in the ooids, along with the partial infill of inter-granular porosity by cement. At even higher magnification (X200) some details of the complex spicule structure of the light coloured areas of the sponge are now visible, indicating that the sponge belongs to the Lithistid family. A spiral-shaped silicified microfossil, probably a foraminifer, is visible in the sediment filling the canals, along with other, less identifiable fossil fragments. The higher magnification has revealed that some ooids have a radial as well as a concentric fabric, and that the porosity between the ooids has been partly filled by bladed calcite cement. The beauty of the USB microscope is its simplicity, utility, and adaptability. An instrument such as this is likely to find ready application of a crewed Mars mission. Linked to a small tablet, or perhaps a screen inside a helmet, it would be an excellent substitute for that essential tool of the field scientist, the hand-held magnifying lens. Though useful, such lenses are very difficult to use while wearing a space suit. In addition to being of scientific utility, a tool such as the USB microscope can be used to detail with a range of engineering tasks which require inspection of small components or surfaces. Such a tool would bridge the imaging gap between high resolution hand-held digital cameras and laboratory microscopes.